At Oriental Rug Salon, every Oriental, Persian, Turkish, wool and silk area rug is treated as an individual piece of art and cared for by the love, experience, and hands of a certified textile cleaning professional. We do not use impersonal “rug cleaning machines” and each area rug trusted to us is cared for one at a time. Handwoven wool and silk area rugs have a story to tell, and they have special cleaning needs to preserve their life, luster, and beauty. At the beginning of a rugs life, wool is sheared, cleaned, twisted and dyed. A series of warps and wefts are strung on a loom, and dedicated artisans meticulously spend hundreds or thousands of hours to create the masterpiece you enjoy. Many hand-woven rugs are dyed in small batches with villagers using plants and insects in the creation of the beautiful colors you see. The craft of dying and twisting along with the selection, cleaning and sheering processes, has been passed down from generation to generation. With proper care, these rugs will last for generations. When it’s time to clean an area rug professionally, consumers typically have two choices, hand-wash or batch machine wash. Some area rug cleaning companies use automated batch wash tubs that allow them to “clean” many rugs at the same time. Wash tubs are an excellent investment for the company that owns them because they greatly enhance productivity and that equals PROFIT. Wash tubs can hold up to a dozen rugs at a time, and each rug is cleaned the same way regardless of a particular textiles needs. Rugs that contain pet urine are washed with carpets from owners that have never owned a pet. Bleeders are washed with rugs that do not bleed, etc. 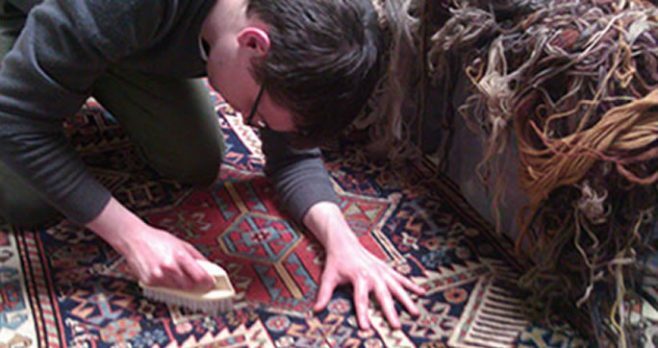 At Oriental Rug Salon, we hand-wash each rug, and it is treated as if it is the only rug in the building. Regardless of the value, size, or textile type of an area rug, each is washed by hand for the best results possible. Our technicians are experts in wool and silk textiles, and we receive rugs and carpets from around the United States whose owners appreciate our meticulous attention to detail afforded each rug. At its simplest, cleaning a rug is about removing soils, sand, oils, dust mites, pollen, and other contaminants while extending its life. Without proper care, dirt and sand cut at the fibers of the rug causing permanent damage, premature aging, dry rot, and traffic lanes. Also, insects such as moths and carpet beetles can consume the rug’s foundation and face yarns, and the accumulation of dust mites and pollen will contribute to poor indoor air pollution. Oriental Rug Salon’s area rug cleaning services are designed to deep clean your area rug while extending its life and restoring the glorious hues and tint of each fiber. Our services are relied upon by rug collectors, restoration and insurance companies, Oriental rug retailers, and consumers who cherish their area rugs. Oriental Rug Salon is a Certified Partner with the prestigious Institute of Inspection, Cleaning and Restoration Certification (IICRC) and the International Carpet & Rug Institute (CRI). Also, we are A+ Rated by the Better Business Bureau and a five-year-in-a-row-winner of the coveted Angie’s List Super Service Award. For more information on our hand-washing of Oriental area rugs, please visit Oriental Rug Salon online at www.OrientalRugSalon.com or give us a call any time at 239-424-8171.